"Yellow. Yellow ground. Yellow buildings. Yellow sky. That's Bahrain. Everything coloured by sand blown by desert winds. "So they did the place a favour when they made it a night race. 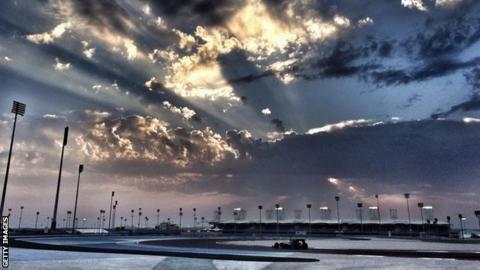 The monochrome outside the track turns black but floodlights and spotlit fountains give the Sakhir circuit a dimension it never had when the race was held in the bleaching mid-afternoon sun. "Outside the track, the political troubles that led to the cancellation of the 2011 event have been subdued, but the undercurrent of tension remains. "The circuit itself? Point-and-squirt, long straights, with few demanding corners, situated near an oil field and an airbase a half-hour drive or so south of the capital Manama on this tiny, troubled Gulf island. "The paddock, festooned in palm trees draped in fairy lights, feels like an oasis. The fantasy works on television. But the realities outside are still there. Out of sight, but not out of mind." Lewis Hamilton prepared for this weekend with an indoor skydive. After a poor start scuppered his Australian GP chances, he'll be determined to make a flying start on Sunday. Organisers spray a glue-like adhesive around the track to prevent sand being blown all over the place. Turn 11 offers one of the best overtaking opportunities around the track while Turn 12 can be one of the most exciting to navigate as a driver - a fast, uphill right-hander where you really have to hang on. A chance of adverse weather? BBC weather's Ian Fergusson: "Strong winds from the west can bring extensive amounts of sand and dust to the circuit at any time, but the most severe, sudden and dangerous sandstorms - known as Haboobs in Arabic - are caused by downdraft winds rushing forwards across the desert from approaching thunderstorms, kicking-up vast, towering walls of dust up to 100km (62 miles) wide. Thankfully, there's no risk of one through the race weekend." "I have a phone in my cockpit"
We've all done it - left the wallet or keys in the car but you would perhaps not expect it in a Formula 1 car! That's what happened to Robert Kubica in 2010, when he found a mobile phone in the cockpit of his Renault during a lap of the Sakhir circuit.